Submitted by Alexander Briones on Jan. 14, 2019..
85 out of 100. Incorporating 175+ ratings and reviews. The Electro-Harmonix 360 Nano Looper offers essential looping functionality for guitarists in a compact nano size stompbox. The label 360 refers to its recording limit, which is up to 360 seconds, or a total of 6 minutes. To help you organize your loops better, this loop pedal lets you store up to 11 different loops, as long as you don't go over the 6 minute limit. This is its standout feature, because it lets you store and play loops that contain riffs, melodies and song ideas, for use when practicing, performing and writing songs. 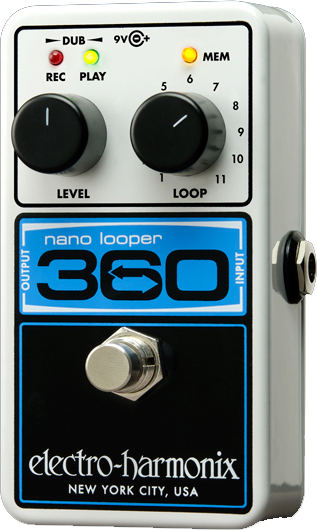 Other features of the 360 Nano Looper include unlimited overdub/undo/redo functionality via variations on how you step on the pedal's single footswitch. Dimensions: 2.75" x 4.5" x 2.1"
The overall response to the EHX (Electro-Harmonix) 360 Nano Looper is positive. Value for money, ease of use and sound quality are three common themes among its many reviews. Being streamlined and compact have its drawbacks, as evidenced by complaints about the pedal's lack of USB interface and battery power option. There are also a few who wanted more control over the loop, which should be an obvious limitation given its affordable price tag and small size. All in all, the Electro-Harmonix 360 Nano Looper saves you both money and pedalboard space, while retaining respectable functionality. This used to be on our recommended list but more highly rated loopers were available in January 2019 when we updated our guide to The Best Loop Pedals.